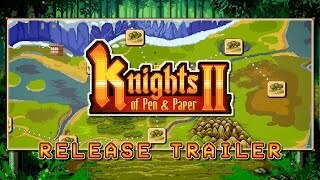 Prepare to join Knights of Pen & Paper 2 in a turn-based, retro style, pixel-art adventure full of danger, intrigue, and semi-appropriate cultural references! Assemble your party and control your group of pen and paper role-players as they are guided through their adventures by the Game Master. All the fun of pen and paper RP, none of the lost dice! -> Play a group of pen and paper gamers playing a pen and paper role playing game. -> Create your own characters, how about a Rocker Dwarf Warrior or a Cheerleader Elf Monk. -> More contemporary geeky jokes than you can stuff in a CAVE! Gotta catch them all! -> Lots of monsters, equipment, a crafting system, and things to customize. -> There's no paying your way to victory here! Start with all of the content, unlock it with the blood, sweat, and gold coins, of your party! -> Customizable hot keys, Steam Controller and Gamepad support.